That blank page is staring you in the face. You want the job so badly, but how do you express that in your cover letter? If you’ve read our post about how to address a cover letter, you should already have that information on the page. But where do you go from there? The first few sentences of your cover letter can make or break your chance for an interview. The recruiter or hiring manager is responsible for sifting through dozens, even hundreds of cover letters. 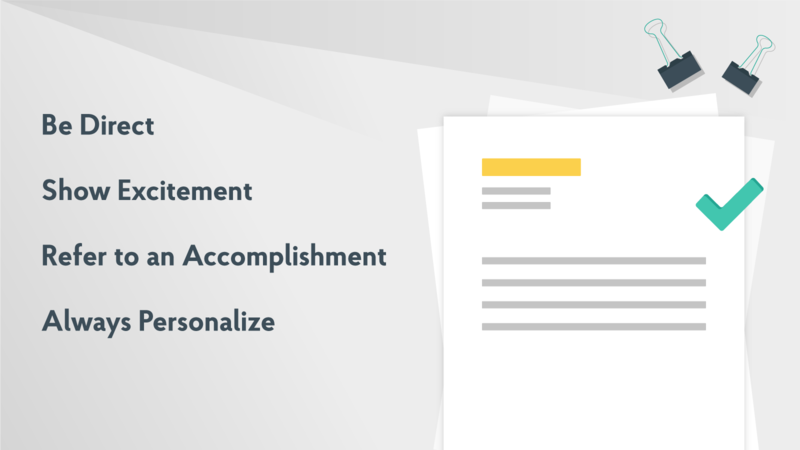 They may only have seconds to skim your cover letter before moving on to the next candidate, so you want your first few sentences to be engaging and relevant to the position. You need to introduce who you are, demonstrate why you are the best person for the job, explain why you want the job and show a little personality. If you follow these tips you’ll be impressing hiring managers with your wit, charm, and experience. You want to set yourself apart from the dozens of other applicants, and you only have a limited amount of time to do that. Your first few sentences are the most important. Here are some tips to stand out. Hiring managers and recruiters see a lot of cover letters, and they don’t have time for fluff that doesn’t say much of anything. A little brevity can go a long way when setting up the introduction of your cover letter. People want to see that you are excited about working at their company. You want your enthusiasm to shine through in these first few sentences. Hiring managers want to know that you’re up to the job. By highlighting a relevant achievement, you can demonstrate that you are prepared to successfully perform all job duties. The recruiter or hiring manager can tell if you’ve just pushed out a generic cover letter to apply to as many jobs as possible. They are looking for someone who wants to work for their organization, so they appreciate a high level of personalization. While these are just a few examples of how you can begin your cover letter, always make sure you are authentic. No template can take the place of your unique personality that should be on full display in your cover letter. Demonstrate your character, show excitement and call out relevant experiences to stand out from the crowd. If you follow these tips, you’ll be on your way to landing that interview in no time.